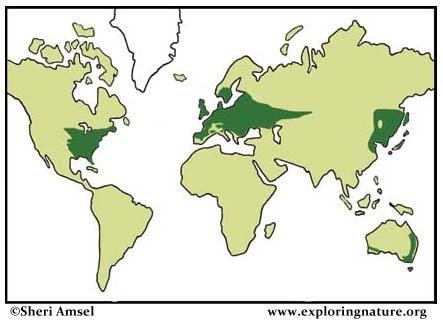 Deciduous forests are found in the eastern half of North America, Europe, Asia, Russia, Japan, China, and a few spots in South America, Australia and New Zealand. 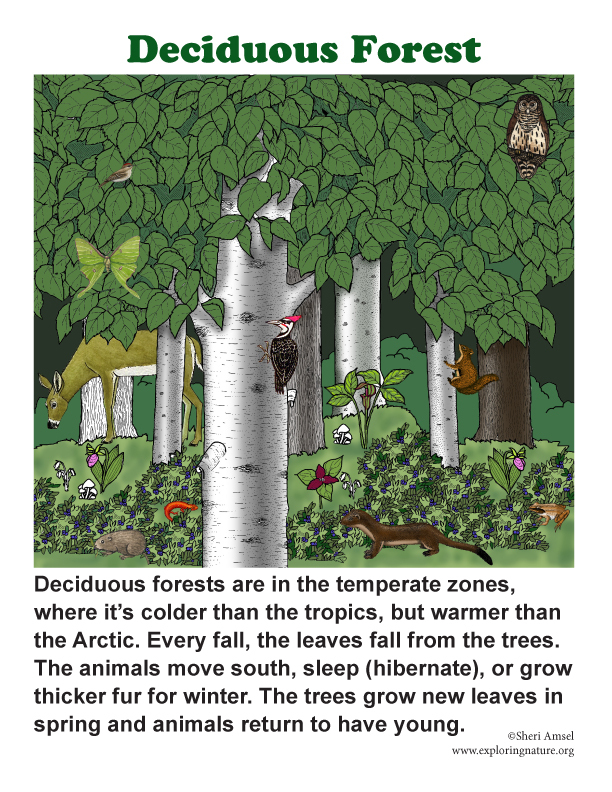 Deciduous forests are located in the earth's temperate zones, where it is colder than the tropical rainforests zones, but milder than the conifer forest zones. They have fertile soils with a good amount of rain (30-60 inches a year). They can live with big temperature changes throughout the year -- the changing seasons. In the summer the trees are in full leaf. In the fall when the days grow shorter (and the temperatures cooler), the leaves change color and fall. During the cold winter months, the trees lie resting (dormant) with no green leaves to make food. In the spring, with days lengthening and warmer temperatures, the leaves sprout and this begins the trees' 6-month growth period again. Deciduous forests are broken down into five layers (or stratum). The tree layer (tree stratum) has tall trees from 60-100 feet tall, like oak, maple, hickory, beech and elm. The sapling or small tree layer is next with small trees, like; dogwoods and redbuds. The shrub layer follows with bushes, like; azaleas and rhododendron. Then the herb layer with yearly wildflowers, ferns and ground level plants followed at last by the ground layer with mosses, clubmosses and lichens. 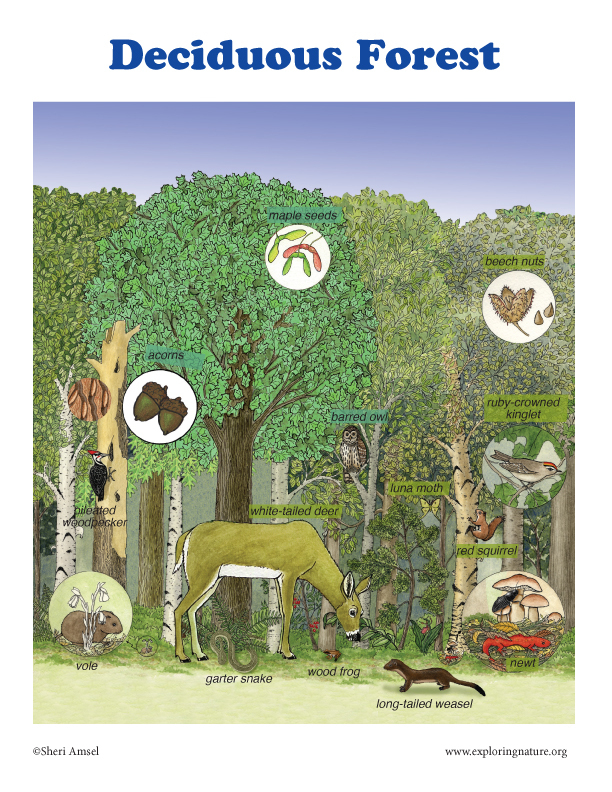 There are many kinds of animals in deciduous forests; birds, mammals, reptiles, amphibians, insects and other invertebrates like millipedes and spiders. Many animals survive the long winter by hibernating, while others migrate south to milder temperatures. Still other animals hunt or forage for food all winter adapting to the cold months, by turning white to blend in or growing thicker fur or feathers to keep warm. Owls may not be seen very much, because they are active at night (nocturnal), but they are very much at home in the forest. They have large eyes, set forward on their head for eyesight. The eyes are so sensitive that they can actually see in the dark. Their necks can turn a long way to follow prey as they move. But their best hunting trick is how quiet they can fly. They can do this because they have fringed flight feathers that hide the sound of air passing through their feathers. Hawks hunt forest edges for small mammals, song birds reptiles, amphibians and insects. The broad-winged hawk is the most common deciduous forest hawk, but the red-tailed hawk and turkey vulture are not uncommon where forests meet open country. White-tailed deer travel in small groups through the forest. They are active mostly at twilight, though can be seen all times of day, feeding on twigs, grass, acorns. If they are startled, their tail flips up showing its bright white underside like a flag. As they run off the white flag waves from side to side to distract predators. Black bear aren’t always black, but can vary in color from tan to black. They are not as big or aggressive as grizzlies, only reaching about 300 pounds, but are still a dangerous predator. They eat almost anything (omnivores) to put on weight for their winter sleep, from berries, nuts and fruits to insects, small mammals and even dead animals (carrion). Bobcats prowl the forests and swamps at night, hunting small mammals and birds and sometimes a deer. They have tufted ears and a short tail with dark bars on it. Lynx are stockier with bigger ear tufts and a black tip on their short tail. Another nocturnal mammal, the raccoon, will eat anything it can find, including human garbage. They are well known for their black face-mask and long, ringed tail. Other deciduous forest animals include squirrels, chipmunks, mice, snakes, rabbits, hares, fox, coyote, fisher, and skunk. Deciduous forests have maples, oaks, hickory, beech, ash, elm, and even some conifers mixed in like: pine, fir and spruce. Their seeds are carried off by the wind or by animals and take root where they hit the ground. Seeds are made to find their way to a place where they can grow. Acorns and seed-filled pinecones are collected by squirrels and chipmunks. When they bury them for winter, they are actually planting seeds. Maple, ash and basswood seeds spiral away from the tree like tiny helicopters searching for a sunny spot to sprout. Cottonwoods spread their seeds on the wind in a cottony puff. Mountain ash berries are eaten by birds and brought to where the birds fly next. Beech, hickory and butternut seeds may be eaten by mammals and delivered somewhere else too. The forest floor has wildflowers, like lady slipper, jack-in-the-pulpit and trillium. There are ferns, mosses and clubmosses too. These plants on the forest floor often bloom early in the spring before the leaves are out to take advantage of the sunlight. Others grow all summer and are shade-tolerant. 1. 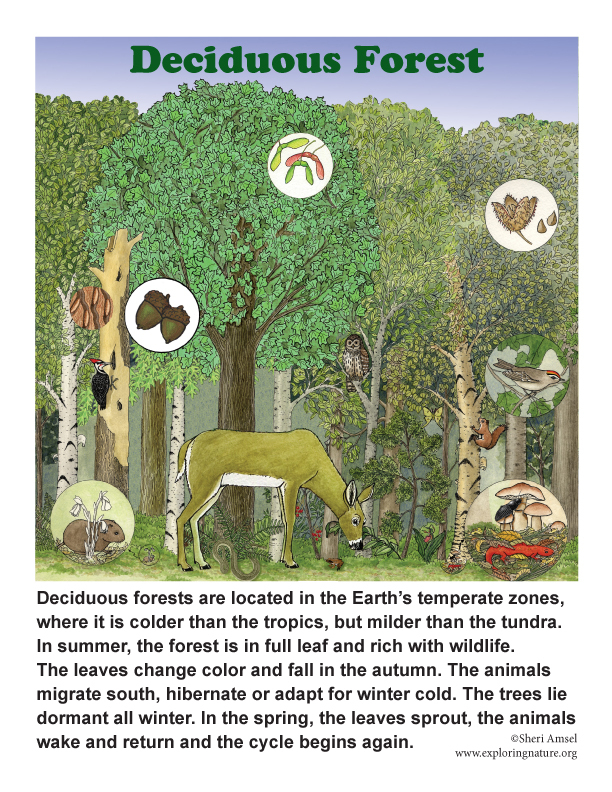 How are deciduous trees different from coniferous trees? 2. What kind of trees grow in your yard? Use the leaf guide to identify 5 deciduous trees in your yard or neighborhood. 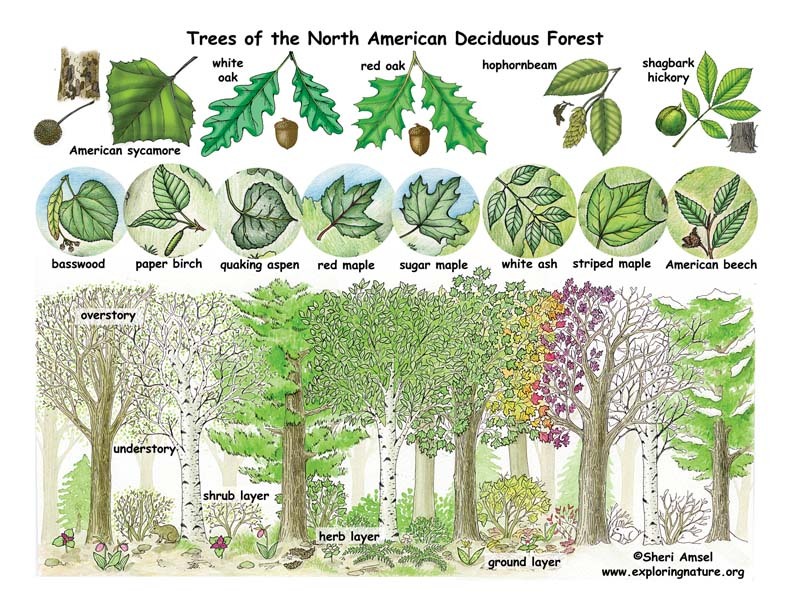 Or with help from an adult, use the dichotomous key to identify your trees. 3. Try the deciduous tree matching sheet. 4. 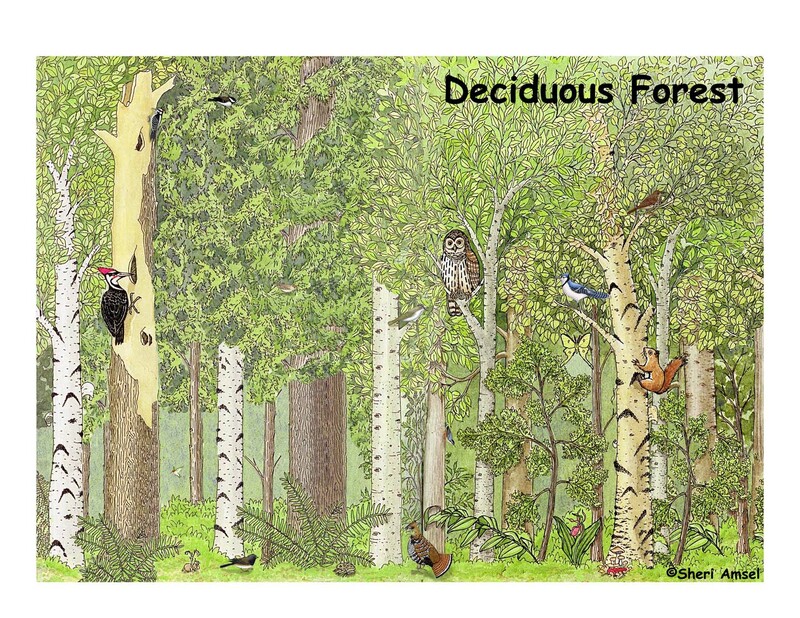 What kinds of animals do you see in and around the deciduous trees? 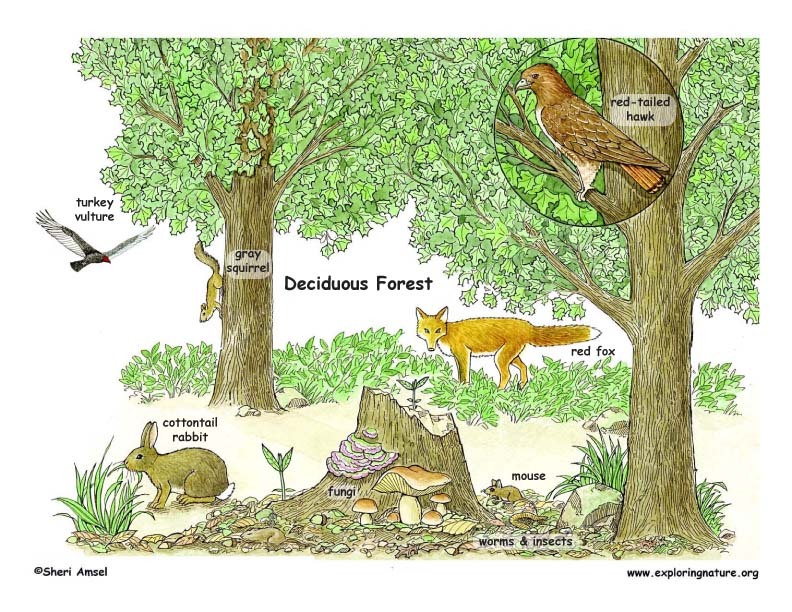 Why do you think small mammals live in or near deciduous trees? 5. Like all plants, trees make seeds. Deciduous trees make fruit in which the seeds are protected. Match the tree to its fruit in this worksheet. 6. Name three things in your house made from trees. 7. Name three other uses for wood.